AMY GOODMAN: This is Democracy Now! I’m Amy Goodman with Juan González. JUAN GONZÁLEZ: As the Trump administration continues to defend firing tear gas into crowds of asylum-seekers at the U.S.-Mexico border, we spend the rest of the hour looking at the history of tear gas, which is banned in warfare but legal for federal authorities and police to turn on civilians. Border authorities’ use of tear gas has spiked under the Trump administration, with the agency’s own data revealing it has deployed tear gas over two dozen times this year alone. Customs and Border Protection told Newsweek Tuesday it began using tear gas under the Obama administration in 2010 and has released the substance 126 times since the year 2012. The agency’s use of tear gas has now reached a seven-year record high under the Trump administration. On Monday, President Trump was asked about the tear-gassing of women and children migrants. AMY GOODMAN: President Trump claimed border agents used a minor form of tear gas, but Customs and Border Protection later acknowledged there’s only one form of the gas that is commonly used. Ronald Colburn, the president of the Border Patrol Foundation and former national deputy chief of U.S. Customs and Border Protection, spoke on Fox & Friends Monday morning. RONALD COLBURN: The type of the deterrent being used is OC pepper spray. It’s literally water, pepper with a small amount of alcohol for evaporation purposes. It’s natural. You could actually put it on your nachos and eat it. So it’s a good way of deterring people without long-term harm. Well, for more, we go now to Baltimore, Maryland, where we’re joined by Stuart Schrader, lecturer in sociology at Johns Hopkins University. He has studied how tear gas went from a weapon of war used in Vietnam to being deployed by law enforcement at home. His forthcoming book, Badges Without Borders: How Global Counterinsurgency Transformed American Policing. Stuart Schrader, welcome to Democracy Now! First, respond to what President Trump and the head of the Border Patrol Foundation said about the tear gas and the fact that it was shot at women and children on the border by U.S. forces. STUART SCHRADER: Well, both of these statements are misleading. In the case of President Trump’s statement, he is trying to claim that the tear gas is a mild form, and that’s simply untrue. The tear gas that was used is a chemical called CS. And the guy from the border patrol is also being misleading, because he’s referring to pepper spray, and again it was CS that was used, and CS is an extremely powerful chemical. And the term “tear gas,” when referring to CS, is misleading, because it doesn’t just make your eyes tear when it affects your body; it also makes all of your mucous membranes become inflamed. You expel large amounts of mucus. You cough. You feel like you can’t breathe. You feel like you’re choking. So the term “tear gas” doesn’t really describe the effects that are the result of this chemical. JUAN GONZÁLEZ: And what is the difference between pepper spray and tear gas? STUART SCHRADER: Well, they’re chemically different substances, and also the delivery methods are different. The CS that was deployed on the border came out of grenades and it came—most people saw images of these kind of clouds of smoke. Pepper spray is a more directed blast that is usually shot between one law enforcement officer and one person or a small crowd of people. Instead, the CS grenades that were used, they diffuse a large cloud of the chemical that can basically engulf anyone who is within the vicinity. AMY GOODMAN: Yesterday, I quoted Karen Attiah, the editor for Jamal Khashoggi—she’s the global news editor at The Washington Post—saying that if American media were describing if this happened in a non-Western country, “American security forces under the Trump regime used chemical weaponsin a cross border operation against unarmed asylum seekers, including children. My God.” Stuart Schrader, can you talk about the history of the use of CS gas? I don’t think people understand. This gas that was used on the women and children who are fleeing persecution and poverty is considered illegal under the Chemical Weapons Convention? STUART SCHRADER: Yeah, that’s correct. The history of CS is a fairly long history. The first ban on chemical weapons that was put into place was all the way back in 1925, and that did not cover CS because CS had not yet been invented. Also, the United States did not ratify that agreement way back when. CS was invented a few years later, and it really came into much more widespread use and was adopted by the U.S. military in the late 1950s, early 1960s. Until that point, there was another form of tear gas that was used, again acknowledging the term “tear gas” is misleading. And the U.S. military phased that out. That’s called CN. It phased it out over the course of the 1960s and replaced it with CS. And the reason was that CS was just much more severe and intense in its effects. So beginning in the 1960s, the U.S. military started to use CS in its operations, predominantly in South Vietnam. When this news hit newspapers in the United States in 1965 that the United States was using gas, the Johnson administration quite quickly tried to downplay the use of the gas. First of all, they wanted to make sure that everybody knew that it was not violating any kind of international treaty, that it was not using mustard gas or something along those lines. But they also made the effort to downplay the severity of CS. And in this way, there’s actually a strange parallel between Lyndon Johnson and Donald Trump, probably the only one that could be drawn, which is that they both have claimed that tear gas, CS, is not so bad. So Lyndon Johnson, his secretary of state, secretary of defense, they all claimed that the use of CS beginning in 1965 in Vietnam was no big deal and nothing to be concerned about. But in fact the effects of CS at the time were severe, and CS came to be used in really, really large amounts, copious amounts, throughout the U.S. war in Vietnam during the 1960s. JUAN GONZÁLEZ: And how then did the use of CS then migrate to domestic police departments, especially after 1968? What was the logic then of how that came about? STUART SCHRADER: Well, when it was used in Vietnam, it was used in two primary ways. Although it was often claimed that it was being used in the setting of riot control, that wasn’t actually the case. In fact, it was used in combat. And one purpose was used to flush people out of hiding. So if people were hiding in bunkers or in tunnels or even just in heavy vegetation, CS would be used to try to force them out. Because of course the main problem for the United States military during the war in Vietnam was finding the people that they wanted to target as the enemy. So CS was used to force people out, because the response that anybody would have to it is basically to flee, as we saw in pictures just the other day. So once people revealed their location, then the U.S. military could target them with more conventional weapons from airstrikes to bullets. And another reason or another purpose of CS was to then contaminate those hiding spaces, bunkers and tunnels. They would be filled with CS, and then people could not go in them and hide after the U.S. military left. Now, these purposes were not the immediate purposes that were used after 1968 in the United States by law enforcement. Rather, it was used in riot control starting in 1968. Now, in 1967, there were large, well-known incidents of urban unrest in cities like Newark and Detroit, and the National Guard was deployed. The National Guard in these incidents used bullets. They used rifles and they shot a lot of bullets. Something like 10,000 bullets were fired by the National Guard in Newark in 1967, and they fired no tear gas grenades. 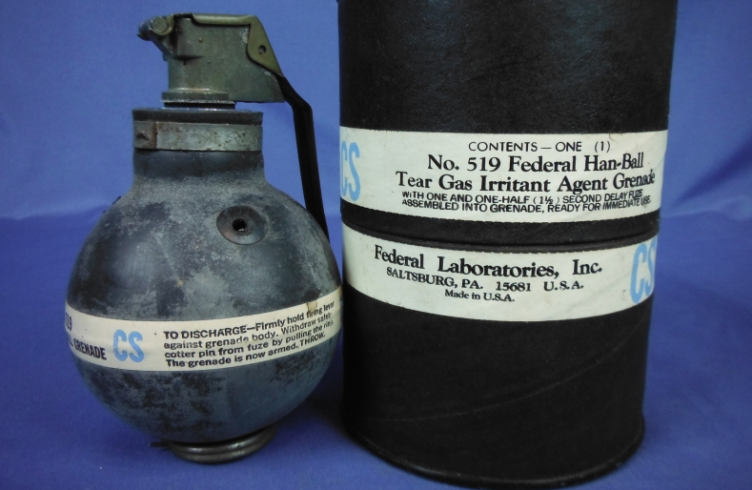 Now, if you fast-forward from July of 1967 to April of 1968 when there was unrest after the assassination of Martin Luther King in cities like Washington, D.C. and Baltimore and others, the National Guard fired less than 20 bullets, but they used something like almost 6,000 CS grenades. Now the reason for this really rapid and dramatic transformation in their tactics in riot control was that after the experience in the summer of 1967, the Johnson administration appointed the Kerner Commission, which did a really extensive investigation into the causes of the unrest and also into remedies for preventing it in the future. Now of course, they recommended a remedy of alleviating racism and poverty, but that didn’t happen. Instead, what did happen was that they had some recommendations about how to change policing, one of which was to use CS. And that recommendation mostly came from experts who were already working overseas in the setting of counterinsurgency and other types of counter-subversive activity. AMY GOODMAN: Stuart, we clearly need a part two on this, but who makes CS? We have 15 seconds. STUART SCHRADER: CS is made by American companies as well as other companies around the world.